Shockingly, Nate was able to make some room alongside his Star Wars and U2 obsessions to include The Wizard of Oz. I guess it runs in the family. Like two of his aunts before him, he just can't get enough of that yellow brick road. His interest started recently with the book. But after seeing a couple of carefully chosen Youtube clips (with his wild imagination, there's no way he's seeing that witch or those flying monkeys until he's older), he took a break from being Luke Skywalker/Obi Wan/Boba Fett and has become the Tin Man. 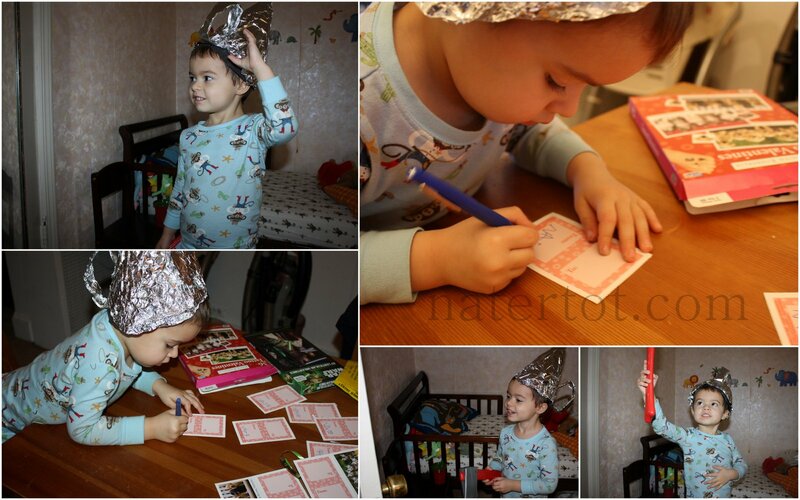 While he was playing dress up the other day, I realized that we had all of the equipment to make Tin Man's hat (tin foil and more tin foil). And he was thrilled to discover that his fireman's ax could be used as part of his costume. He wore it ALL day long. He was jumping out of his skin with excitement to show it to dad. But, of course, that didn't stop him from unceremoniously dumping it in the trash the next day. Ah, three years old.